32% of shoppers are looking for better in-store customer service according to a new market research report. The “2017 Holiday Shopping Report” asked consumers their holiday shopping habits, if they would be using their mobile devices during their trip, and how they felt about their overall shopping experience. Responses were collected from more than 1,000 shoppers at malls across the country using phone charging stations. When shoppers were asked what could have improved their holiday shopping experience, 32% said better customer service. Other responses included cheaper items (22%), more parking (12%), better product selection (10%), and fewer crowds (6%). 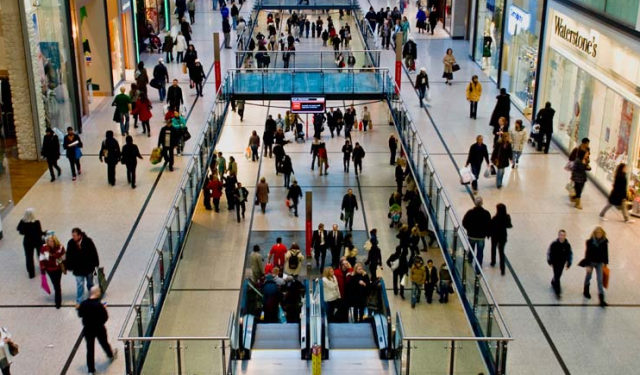 Shopping can be hectic this time of year for both the shopper and the retailer. It is essential that retailers make sure their staff is equipped to help shoppers and make their trip more enjoyable. Despite the call for better customer service, 83% of shoppers felt they had a positive holiday shopping experience, while 11% had nothing positive or negative to say about their shopping trip. The majority of shoppers (34%) plan on making only one holiday shopping trip this season, while 30% plan on making three or more trips, 21% didn’t plan on making any holiday shopping trips, and 14% plan on making two trips. Finally, shoppers were asked how likely they were to do the remainder of their holiday shopping in-store rather than online. 75% of shoppers said it was likely, 18% were undecided, and 8% said it was unlikely. Shoppers will use their phones for a variety of functions this holiday shopping season. Most will use them to enhance their in-store shopping experience – to find store locations (27%), find deals (18%), get or share live updates through social media (14%), compare prices (13%), access coupons (12%), make or refer to shopping lists (8%), and research products online (6%). Very few shoppers (3%) plan to use their mobile devices to make purchases directly on their devices while they are out shopping. Next time you go to a restaurant or bar, just look around and count how many people you on their phone or tablet. Chances are you’ll see more than a few. To the owners and managers of the local bar or the chain restaurant, this can be frustrating since it can distract from the experience of enjoying such an establishment. But, for the savvy manager, this phenomenon can be a great thing for business. There are a few ways that you can improve your bar or restaurant’s business by investing in portable charging stations as a free amenity or a new revenue stream. When a customer orders a meal at your restaurant, there are a probably at least a couple of items they can add-on to the meal for a small up-charge. Maybe they want bacon added to that burger or they want a larger size drink. Why not add a phone charging service fee to your menu? It could be as low as a $1 and this strategy could quickly equal profit for your business and your service staff may even see increased tip income as a result of the added hospitality. In the hospitality industry, things can get very busy and customers may have to wait some time before they can be seated. If your restaurant or bar’s guests must wait to be seated, then chances are they will pass time by using their phones. 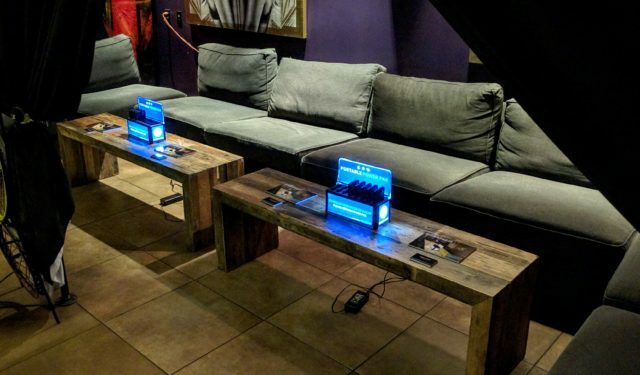 By offering a portable power pack on the house, you can help to keep a frustrated or inconvenienced patron calm and occupied while they wait for their table. This is probably the best reason to invest in portable charging stations. With an unlimited range of custom branding options, you can provide customers with the convenience of charging their mobile device while simultaneously advertising your company and its current promotions. If you are a business owner, ask us about a free trial on the Power Pax, a portable charging system that is ideal for bars, restaurants, and other venues. Ask someone where they’re going on a Friday or Saturday night and you’ll probably hear the name of some local bar or trendy nightclub. When people go to these places, chances are they’ve got a cell phone in their pocket or purse and it’s more than likely that its battery will run out of energy way before they do. Sure, the bar isn’t an ideal place to charge your phone but there’s plenty of reasons for that to change. 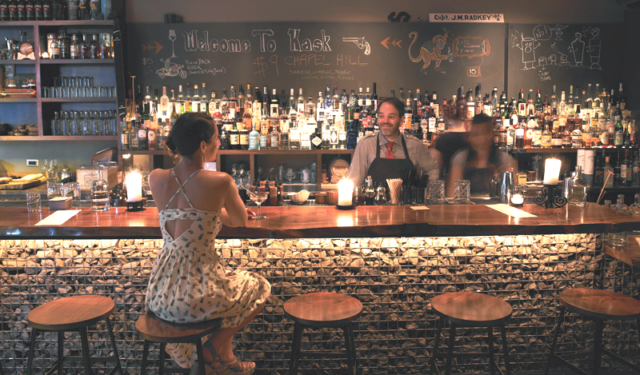 Here’s a few reasons why your bar should have cell phone charging solutions. If you work as a bartender or server in a bar, then you probably already know this. How many times have you been asked by a customer if there’s an electrical outlet nearby? Maybe you tell them no and then they ask if there is one behind the bar. Chances are you hear this at least three or four times a night. It can even infuriate some servers, as evidenced here. It doesn’t take much for customers to leave a bar. The only criteria for their departure is that they have stopped enjoying themselves. A customer will buy one drink roughly every 20-30 minutes. If the customer leaves because their phone has run out of battery, then you lose out on making multiple more alcohol sales. If you have phone charging stations available, then the customer will stay for at least as long as their phone is charging. They may even buy another drink or two while they wait. Yes, you have phone charging stations available, but that doesn’t means they need to be a free courtesy. People are very much tied to their cell phones nowadays and are likely to pay for the convenience of charging their device without having the leave the venue. If you’re uncomfortable with the idea of charging money, then you can at least recommend that the customers tip for the service. If you’re also uncomfortable with soliciting tips, you could always make it into a fun game. The main reason bartenders hate to charge the phones of their patrons is because they don’t want to hear the customer complain if the phone gets stolen or damaged. They have a point, a bar is no place to guarantee the safety of a phone or electronic device. But, with a phone charging kiosk with lockers, your bar patrons can relax when it comes to whether or not their phone is safe. Aside from being a convenient way to let customers charge their phones, you can easily use a self-service phone charging kiosk to promote drink specials or even upcoming events at your bar. This helps bar staff as well since the customer will be told about upcoming events when they go to charge their phone instead of the bartenders and server having to repeat it ad nauseum. Since charging stations and kiosks are an emerging technology and a growing trend, there’s a curiosity factor associated with them. People will stop to check them out. If the charging solution is in your booth at a trade show, or just in your store, it can be a perfect time for you to start up a conversation and give your pitch. About 88% of consumers trust online reviews as much as personal recommendations from people they know. That means an extra star on Yelp can do wonders for your bottom line. If you go above and beyond for your customers and provide a unique amenity, then they’ll have more reasons to say great things about your business. 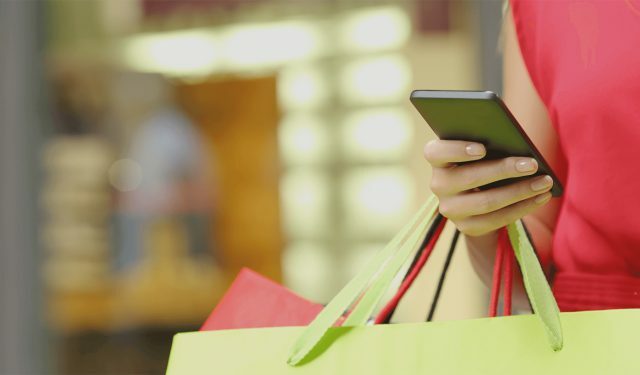 An estimated 75% of shoppers use their mobile devices in-store. According to the CEO of InReality, Gary Lee, “Traditional in-store marketing is still critically important to shoppers, but technology, especially mobile, is having an impact on the store – changing the shopper’s path to purchase and calling for brands and retailers to start rethinking in-store strategies.” While in your brick-and-mortar, customers research products, price shop, and sometimes even make purchases with their phones. Providing charging solutions will allow those customers to still use their phones to do research if their batteries happen to be running low. If you’re considering buying a phone charging station, there are many things to first consider so here’s a how-to guide to help you out. Whether you own a business or are planning an event, a cell phone charging kiosk is a worthwhile investment that provides a great benefit for customers. Just like with sales, know your audience and numbers. Typically, one device charging unit can keep about 400 people fully charged up and happy. A place to store a freestanding or portable charging unit should be taken into consideration before making a purchase. Got space? Stand-alone charging kiosks like the Veloxity LockerPower are typically stored in wooden shipping crates. The crates can be reused 4-5 times and should be kept inside. Portable units like Veloxity’s Power Pax will come in a cardboard box and should also be kept indoors. How much something will cost is very often a concern. Do you go with the lowest price and possibly sacrifice quality? Or do you pay top dollar for a premium product with tons of features? The answer is likely somewhere in the middle, and you’ll chose a product that gives you the best bang for your buck. Purchasing or renting multiple units at a time often warrants discounts from charging station vendors so feel free to ask, it can’t hurt. Price and quality go hand-in-hand. It’s important that the product you purchase is up to your standards and provides excellent value. How exactly can you tell the difference in quality from one kiosk to another? That depends on the amount of features like how many cords are available or if there are branding opportunities. Warranties, which can be limited or comprehensive (keep reading for more). And finally certifications that give you a baseline for how reliable or environmentally friendly the charging kiosk is. One example of a certification program is Apple’s MFi system. Be sure to ask about the operating system and if the charging cables are MFi certified. Cell phone charging kiosks are an investment for your business, so what good are they doing for customers if they don’t work? As an owner or renter you’ll want to make sure the station is always running. You also don’t want to waste time trying to fix issues on your own, so having access to a support line is necessary. Some vendors will charge a monthly support fee while others will provide it for free. Protecting your investment is very important and sometimes overlooked. Besides support, you’ll want to learn about the warranties as a form of insurance and a way to save you both time and money if there happen to be any issues. Read the fine print and ask questions. Before you buy something online or visit a restaurant, you probably read a few reviews and check background info on the company, so it shouldn’t be any different for a charging station. You don’t have to be a detective to find background info on the company you’re buying from. Just do a simple google search to see which companies they’ve sold to, or if they’ve sponsored any events. Ask for references. Veloxity is a one-of-a-kind provider of cell phone charging stations. What Businesses are Using Phone Charging Kiosks? Most people today understand how frustrating it is when your phone hits 20%. You’re immediately scurrying around for a phone charger and if you don’t have one then you’re spending the rest of the day nursing your phone’s battery. It’s an issue because it’s our main form of communication and phones are increasingly playing a greater role in our everyday lives. How Can Businesses Solve This Need For Their Customers? The solution that businesses can use is providing customers with a phone charging kiosk or phone charging station. Veloxity phone charging kiosks offer many benefits that are simply not offered by other companies, such as remote access, usage analytics, and a secure place to charge a phone. For people attending a conference, guests can plug their phone into a secure locker and don’t have to worry about making sure no one steals their phone. 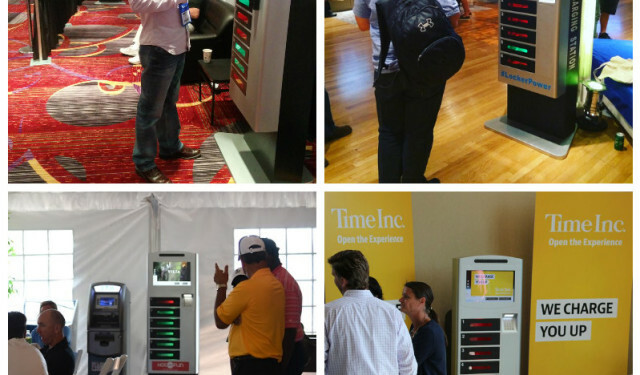 Cell phone charging stations can decidedly make trade shows more powerful. Attendees, exhibitors and event planners alike are always armed with their cell phones. As of 2017 (77%) of US adults own a smartphone. In 2015 (64%) of U.S. adults owned a smartphone, up from 35% in 2011, according to Pew Research. The next time you are at trade show, conference or event, or even a resturant notice how many people are looking at their phone or tablet as they are sitting, standing or walking? It’s a way of life. But what happens when a cell phone or device is loose power? Panic and frustration. People look for a nearby outlet and wait for the dreaded red battery symbol to turn green. What also often happens is that people experience dead battery anxiety and leave an establishment or trade show early in an effort to get plugged-in. 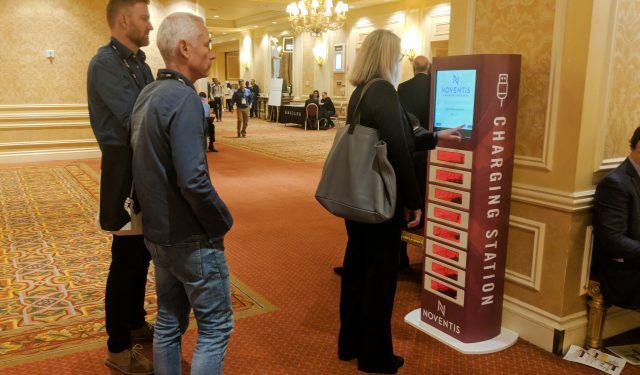 Given that attendees usually spend at least a few hours on the trade show floor, it only makes sense that they might be look for an outlet on the show floor or want to return to their hotel room for a charge. 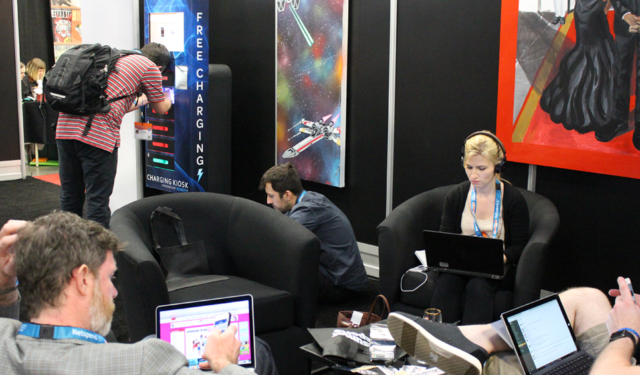 As result, attendees miss out on trade show presentations and exhibit hall all while exhibitors loose interaction time. It’s one fine mess. Cell phone charging stations can cure dead battery anxiety and help keep attendees and exhibitors fully charged. =&0=&by actually providing a service they find unique and personally beneficial. While you have their attention talk shop! =&1=&right on the charging kiosk LCD display screen. The screen is a great display opportunity to keep attendees interested while they are waiting for their device to charge. =&2=&and gain one on one time with a prospect. This is a great conversation starter an alternative to the traditional greetings on the trade show floor. =&3=&by adding your logo and brand identity to front and sides of the charging kiosk. This extra real estate offers a unique way to promote your messaging and attract your constituents. =&4=& to partners or vendors. Sponsors can deliver their message to a captive audience. The interactive touch screen on the top of the kiosk can deliver fully customized video contest to enhance the user experience. 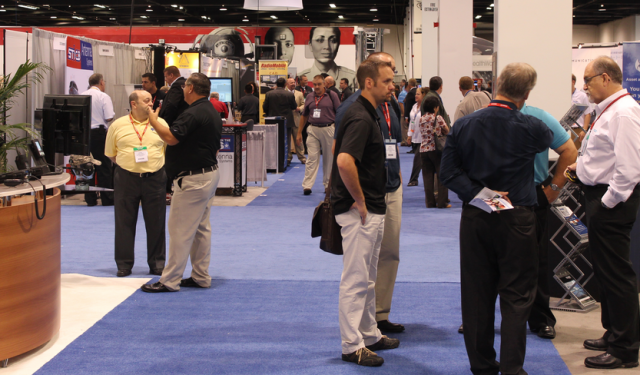 Many companies these days offer =&5=& for trade shows, events and conferences. 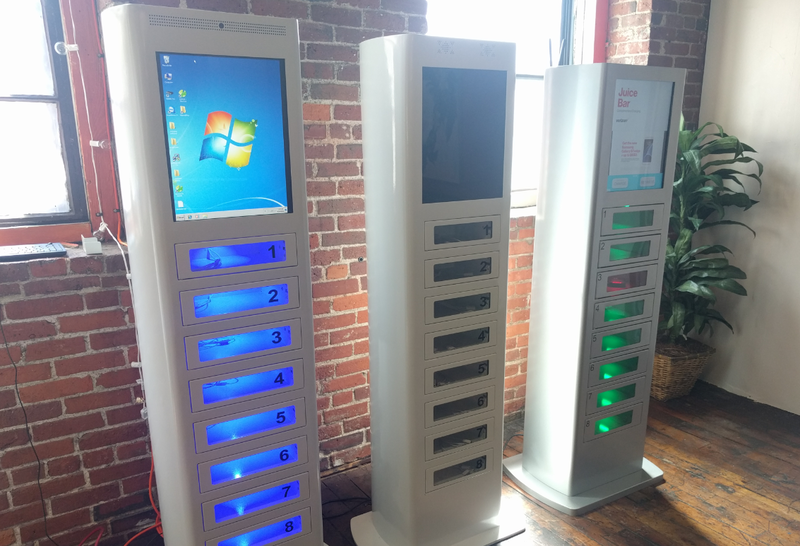 Veloxity is one such company that rents and sells cell phone charging kiosks to help make trade shows more powerful. A man cave with a 110-inch Ultra HDTV is a challenge for keeping stadium fans in the stands at sporting events. Thanks in part to new niceties, crowds at stadiums still go wild despite the continued growth of televised sports. While scoring high TV ratings is a big money-maker for sporting events, in-person attendance remains crucial to the bottom line in the industry. Across the nation, stadiums are now equipped with swimming pools, massive jumbotron screens, lounges and Wi-Fi networks. 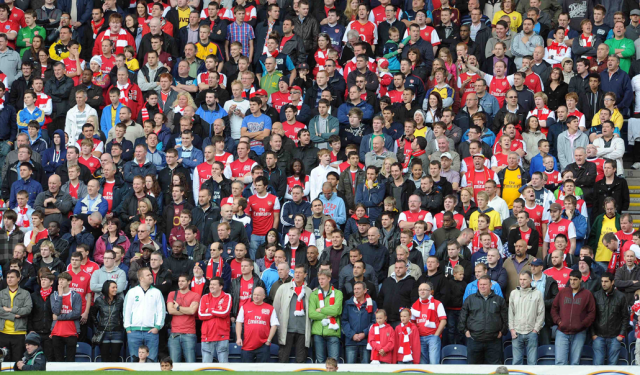 The stadium experience as we know it is transforming at a revolutionary rate. For example, you can still get that footlong hot dog, but high-quality food options are now a staple at every major sporting event. It seems like just yesterday that popcorn and soda were pretty much the only options. The innovations certainly haven’t stopped, as the future holds many exciting possibilities. One that could prove to be particularly significant is the integration of smartphones into stadium tech. Ordering food and drinks from your seats – or checking bathroom lines before even standing up – is the kind of convenience-driven innovation that will sell tickets. Another intriguing development is the paperless “loaded ticket” trend. The New York Jets offer pocket-sized smart cards that earn reward points each time they’re scanned at the gate. Much like credit card rewards, consumers can cash in their points for team merchandise, playoff tickets and more. The perfect complement to these new amenities would be some cell phone charging stations. How convenient would it be to get some extra juice for your phone while waiting in the concession line? 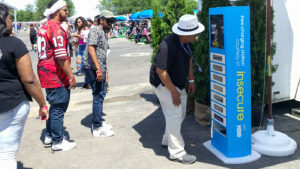 Having a sleek charging kiosk that is free to use and can be custom wrapped with any advertisement your area wants may be the perfect eye catching way to attract business for your company. Shopping malls are shopping for shoppers. We all know that traditional shopping malls took a big hit after the economic crisis. Problems at commercial retailers such as Sears, J.C. Penny and Macy’s could signal even more trouble. The good news is malls are trying to adapt. As online shopping grows bigger, competition is becoming fierce in the world of brick and mortar retail. Same day delivery: This time saving perk allows shoppers to have in store purchases delivered to nearly any destination within a certain radius the same day. Its become a must have because of the added ease and convenience. Transportation Courtesies: Parking can be a huge hassle during peak shopping season. Customers having to make in- and- out purchases now have new options on even the busiest of shopping days. Some mall locations have added parking ambassadors to assist guests with parking and provide up to date knowledge on lot status. In addition several locations have partnered with Uber to provide free trips to participating malls. Uber stands are available inside the mall so there’s no waiting in the cold. Cell Phone Charging Stations: Nothing can put a damper on your mood quite like a dead cell phone battery. Many malls have realized that true service includes more than providing just information, so some malls have introduced cell phone charging stations to help guests avoid the anxiety of a dead battery. There are many companies that have partnered with malls to offer commercial cell phone charging stations. This means customers can simply walk up to the station, enter a pin or swipe a card, then connect their phone inside a private locker. Cell phone charging kiosks are a perfect addition to a shopping mall because for the most part once you enter the mall to poke around you end up staying for longer than expected. I know I can go to the mall for one store and end up staying for over an hour. With a cell phone charing kiosk I can charge my phone while getting my errands done. Its truly a win-win.